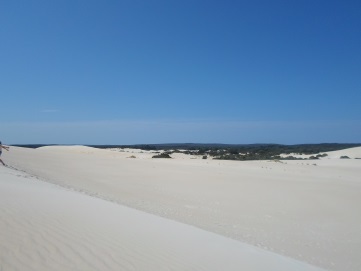 Little Sahara is a small patch of dunes on Kangaroo Island that can be found away from the coast, out of sight of any beaches. It's too small to feel like much of a desert, but it's great for an adrenalin rush, and all you need is one big hill for that. 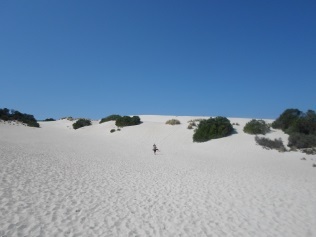 Hiring a sandboard or taboggan fom Kangaroo Island Outdoor Action (who also offer quad-biking and kayaking elsewhere on the island) is a must at Little Saraha. It doesn't matter which one you choose – both cost $29.00 for an hour and $39.00 for a whole day (that's per board, not per person). An increase of $10.00 may sound like a bargain when it gets you the rest of the day, but imagine climbing up a hill over and over again all that time (I guess I'm saying, most people opt for the single hour). The experience is already one of the more expensive on the island anyway. 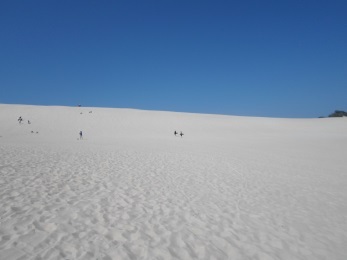 I found that the toboggan was the easiest way to get down the dune in one piece, and I preferred sliding down on my stomach (partly because I could use my feet to slow down). When I tried to sit up the board went everywhere. I didn't even try standing up on a sandboard. The whole time I was at Little Sahara I only witnessed one person successfully stand on the board (some experience on other boards is likely necessary) and that was the same person who injured herself on one of her early attempts. There is a reason you're asked to sign a form before you try it yourself. 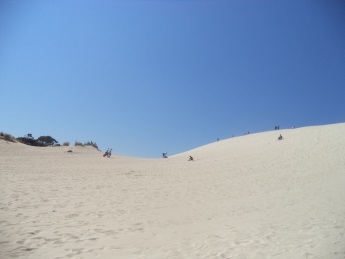 Little Sahara is one of the busier and more popular attractions on the island. It's also close to the even bigger drawcard, Seal Bay, where you can see a rare colony of Australian sea lions. There isn't too much accommodation over here (in the south west) so you may want to consider doing what my group did and head to Little Sahara in the morning and Seal Bay in the afternoon, with lunch over at Bales Beach.